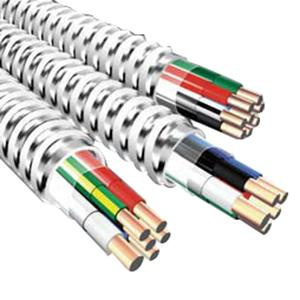 Super Neutral 12/4-10/2-12/2 Traditional MC armored cable has interlocked white painted galvanized steel striped armor for mechanical protection. This 0.735-Inch OD copper cable has THHN/THWN insulation that offers protection against electrical threats. It has voltage rating of 600-Volts. Cable has black/red/blue/pink color-coded phase conductors, white/white with black stripe color-coded neutral conductors and green/green with yellow stripe color-coded ground conductors for easy identification. Cable reduces the effects of harmonic currents on the neutral conductors generated by non-linear loads. It withstands temperature rating of 90 deg C in dry condition. This 1000-ft cable comes in a reel. It is perfect for branch circuit and feeder wiring for computers, programmable controllers, electronic discharge lighting, office machines and other electronic equipment. Cable is UL listed, NEC certified and meets Federal specification.